A Quest for Global Peace A Dialogue Between Sir Joseph Rotblat and SGI President Daisaku Ikeda Sir Joseph Rotblat (1908-2005) was one of the scientists recruited to work on the U.S. project to construct the atomic bomb during World War II. He left the project when it became clear to him that Nazi Germany would not succeed in developing their own atomic bomb. He subsequently became a tireless campaigner for the abolition of nuclear weapons, co-founding the Pugwash Conferences on Science and World Affairs in 1957. He was awarded the Nobel Peace Prize in 1995. Daisaku Ikeda is president of the Soka Gakkai International and has spearheaded the organization's nuclear abolition and peace activities since the 1960s. This dialogue is taken from the book A Quest for Global Peace: Rotblat and Ikeda on War, Ethics and the Nuclear Threat (I.B. Tauris, 2007). 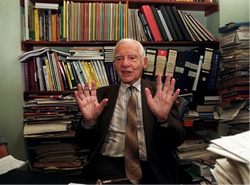 Joseph Rotblat in his office, 1995 [© AFP PHOTO] Ikeda: Professor Rotblat, you participated in the U.S. project for the development of nuclear weapons, the Manhattan Project, at first, but you resolutely quit the project. I would like to ask you, where were you on August 6, 1945, when Hiroshima was struck by the atomic bomb? Also, how did you find out about it? Rotblat: At that time, I was living in Liverpool, England. I had already left the Manhattan Project and departed from the U.S. When it became clear that I could not be prevented from returning to England, I was presented with a condition that I must not contact any of my former colleagues who worked at the Los Alamos Laboratory [in New Mexico]. All letters were screened and recorded, so I did not send any letters to my former colleagues. I was afraid that it would put them in danger. As a result, after leaving Los Alamos in December 1944 and returning to Liverpool, I had no idea of what was happening there. This was the context in which I heard the news of the atomic blast. It was August 6, 1945. I heard about it on a BBC news broadcast. Ikeda: How did you feel when you heard the news? Rotblat: I was numbed by the shock because, at that time, I still had hope. It was a faint hope, but I had hope that the Americans would be unsuccessful at building the bomb. I thought that since the research had been conducted completely on the basis of theoretical calculations, perhaps at the actual bomb-making stage it might not work. I also harbored hope that even if they were successful at making a bomb, they would not use it, especially against civilian populations. In other words, even if a bomb were successfully created, it would first of all have to be tested in a remote location such as an uninhabited island. And so I still hoped that the Americans would tell the Japanese, "Look! We have this super weapon," and then the war would be over. But sadly, reality unfolded quite differently. Man's first atomic bomb was dropped on a civilian population. 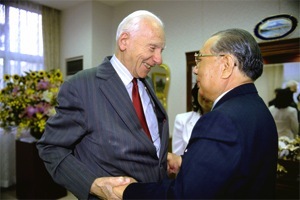 Joseph Rotblat and Daisaku Ikeda meet in Okinawa, February 2000 [©Seikyo Shimbun] Ikeda: The news of the dropping of the atomic bomb was broadcast through the public-address system at Los Alamos. [We are told that] at that moment, the entire Los Alamos Laboratory erupted in victorious jubilation. However, later that evening a gloomy mood enveloped the celebration party. After the elation and sense of accomplishment wore off, they were left with a sense of regret and foreboding. Rotblat: I was completely overcome with hopelessness. It was an indescribable sense of shock from which it took a long time to recover. This is because I knew that the dropping of the bomb on Hiroshima was just the first step in an extended program of nuclear weapons development. At that time, I knew that the hydrogen bomb existed, but it was highly classified. I knew that a weapon possessing a thousand times more destructive power would be developed next. Ikeda: If I were to categorize human history into parts, I would draw the line between the pre-nuclear and post-nuclear periods. This is because, with the introduction of nuclear weapons, for the first time, the extinction of the human race became a conceivable reality. We must never lose sight of the fact, however, that human beings created nuclear weapons. Urgent Efforts Rotblat: I became obsessed with the need to discover a way to prevent human extinction. Let me illustrate how driven I was by this goal. When I look back now, I wonder how I ever came up with such a crazy idea. Thinking as a scientist, I looked for a way to halt research in nuclear physics. I wanted to do whatever it took to stop the development of the hydrogen bomb. I thought that this could happen if all the scientists agreed to temporarily halt their research. So I proceeded to contact scientists, primarily physicists at English universities, to convince them that something needed to be done to prevent the extermination of the human race. Ikeda: What kind of response did you receive from the scientists? Rotblat: Many of them did not realize the nature of the problem, and so there was not much reaction. Some of the physicists were sympathetic to my position, but others were completely opposed. I realized that it would be impossible to halt all research and, realistically speaking, all indications pointed to the inevitable progression of worldwide nuclear research. Ikeda: Professor Rotblat, I empathize completely with your sense of urgency and concern. In any case, you were moved to action. A person's worth must be determined, not by thoughts, but by actions. Many of the people involved in nuclear weapons research at Los Alamos were very emotionally conflicted about their role. And after the atomic blast, some people were filled with regret. But Professor Rotblat, you were the only one who acted upon your convictions and quit the Manhattan Project before the bomb was dropped. Betrayed by the Bomb Rotblat: Personally speaking, the atomic bomb did not only fill me with dread, it made me wonder about the survival of the human race. It also made me determined to devote the rest of my life to making sure that nuclear weapons would never again be used. To begin with, in 1946 I established the Atomic Scientists' Association in England in order to organize scientists to fight against any effort to use nuclear weapons. Next, I felt impelled to share the reality of nuclear weapons with the public at large, because the average person had no idea about the dangers and threat of nuclear arms. I poured much of my energy into exhibitions that explained the beneficial uses of nuclear energy as well as its abuse in destructive military campaigns. I helped sponsor a mobile exhibition that was carried in a train of two carriages. We called it the Atom Train. This was our first attempt to convey information and educate the public. This train exhibition traveled through the British Isles and then throughout Europe, and even went as far as the Middle East. The participants in the first Pugwash conference, 1957; Joseph Rotblat, seventh from the right [Pugwash Conference on Science and World Affairs] Ikeda: What an amazing venture! Rotblat: I felt that I was betrayed by the atomic bomb. I consider myself a scientist who strives for the benefit of humankind, not for its destruction. I felt that if my scientific research was going to be used, I would want to decide how it could be used and to see with my own eyes it being used in beneficial ways. Nuclear physics was being used in numerous ways in the field of medicine, so I decided to abandon my ambitions in the field of nuclear physics and specialize in the medical application of physics. Ikeda: You have visited both Hiroshima and Nagasaki. Did you experience a shift in your perceptions after visiting Hiroshima? Rotblat: Absolutely. After seeing with my own eyes the devastation wreaked upon Hiroshima, I was able to convey more clearly to others the magnitude of misery inflicted by nuclear weapons. When I viewed the photographs in the Peace Memorial Museum, I could barely contain my tears. Ever since, I have been urging the museum to establish permanent exhibits in many other places outside Hiroshima. Every town and city should have an atomic bomb exhibit to remind people constantly of the horrors of the atomic bomb. Ikeda: At this point, what lessons do you think humanity should learn from Hiroshima and Nagasaki? Rotblat: I have a rather broad view of their potential contribution that includes but also goes beyond the effort to abolish nuclear weapons. In other words, I believe that we must strive to create a world without war itself. I have set myself two goals in my life--one short-term and one long-term. My short-term goal is to abolish nuclear weapons, and the long-term goal is to eliminate war entirely. I do not believe that I will live to see either of my objectives achieved within my lifetime, but I believe that ultimately they will be realized. The Bigger Agenda Ikeda: Our duty as citizens of the twenty-first century is to work toward a world without war. First of all, we have a responsibility to the past. We live with the knowledge that over one hundred million people have been sacrificed to war in the twentieth century. We have a responsibility to these people. Second, we must consider our responsibility in the present. In today's world, hundreds of millions of people live in abject poverty and are on the verge of starvation. War only aggravates those problems, and moreover, war gives rise to further wars. Humanity must interrupt this vicious circle. Third, I would like to point out our responsibility to the future. In today's world, wars and the buildup of armaments are not only likely to lead to nuclear war but will surely threaten humanity with their massive power to devastate life systems and the environment on a global scale. If a nuclear war were triggered, humanity's continued existence would be in question. Rotblat: What concerns me is the thought that nuclear weapons will not be the final weapon invented by scientists. With the advance of research, new types of weapons that inflict even greater massive destruction will be developed. Therefore, until humankind learns to coexist without resorting to war, we are not safe. Ikeda: The development of nuclear weapons began initially in response to the threat from the Nazis. The reasoning then became "to contain the Soviet Union," and next, it shifted to a deterrent role that held the threat of "massive retaliation" and maintained an understanding of "mutual assured destruction" or MAD. The ending of the Cold War provided a golden opportunity to end the nuclear age once and for all, but nuclear weapons were retained and now are being considered for use in conventional warfare. In other words, nuclear weapons do not continue to exist out of necessity. Rather, you could say that there are those who need to justify the existence of nuclear weapons by finding a convincing argument. So, against this illogical backdrop is, as you often say, a persistent "culture of war" in which military might begets even more powerful military force. Rotblat: Victory will never be achieved by opposing evil with the power of evil. It does not make sense to try to avoid war by using the threat of war. We must learn to resolve our conflicts without resorting to military means. We must not bring human civilization, a miraculous product of millions of years of evolution, to an untimely and tragic end. Ikeda: When we look at the harsh reality of the international situation, some say that it will be impossible to abolish nuclear weapons. These people are committing the error of predicting the future based on the conditions of our present reality. As you often mention, during the period before World War II, France and Germany were bitter enemies. Today, however, both countries form the nucleus of the European Union. Examples such as these abound throughout history. A major human weakness is assuming that the reality before our eyes will continue unchanged into the future. We must not forget that the success of the movement to abolish nuclear weapons will be determined by human will.